Welcome to the fourth year of our Exclusive Free Mystery Block of the Month by Pat Sloan! This year Pat's theme is 'The Children’s Library'. Each month Pat will share a favorite childhood book that needs to be in our library. Each month is a new book (or series) that is loved by so many. You can find the block pattern download down the page below where Pat discusses the book. The supply list and blocks during the year will always be found at our landing page for the mystery. You'll find a list of participating shops here. The three prior years are also still available at the ‘Mystery BOM’ tab above. When I decided on the theme of the Children’s Library, it brought back such a happy wave of memories. I have my strongest childhood book book memories of when I really started reading stories I selected for myself. That was about 5th or 6th grade. I knew that I had to include my all time favorite book, and deciding which block to use was fun.. and that block is today! The book was written in 1865 by an English mathematician, Charles Lutwidge Dodgson using Lewis Carroll as a pen name. Telling the tale of a girl named Alice who follows the White rabbit down the hole into a fanciful land of peculiar creatures and odd happenings. I can vividly remember being fascinated that she blindly followed the White Rabbit (something I’m sure I wouldn’t do unless Mom said it was ok). And then, like Alice, I was curious about all the things that happened. From the Cheshire cat to the Queen, the images I painted in my head were wild and vivid, just like the book. The navy book was giving to me by my husband when we were dating, I must have been talking about the story a lot for him to notice. The beautiful illustrated version was a gift from a quilter, because again, I tend to talk Alice quite a bit. Thinking about this book had me dig around for a project from years ago.. you can see that at my website along with Alice themed fabric I did for a block! and movie after movie about the book. Come see a second version of the block I did at my website PLUS a it more about my ‘Alice Obsession’. You Also enter your quilt blocks in the Quilt show at my page! Learn more from Pat! And enter your quilt in the Quilt show! Sign up to be the first to hear about each month's block! This year I’m introducing you to two shops each month. So once you download the block, visit them! 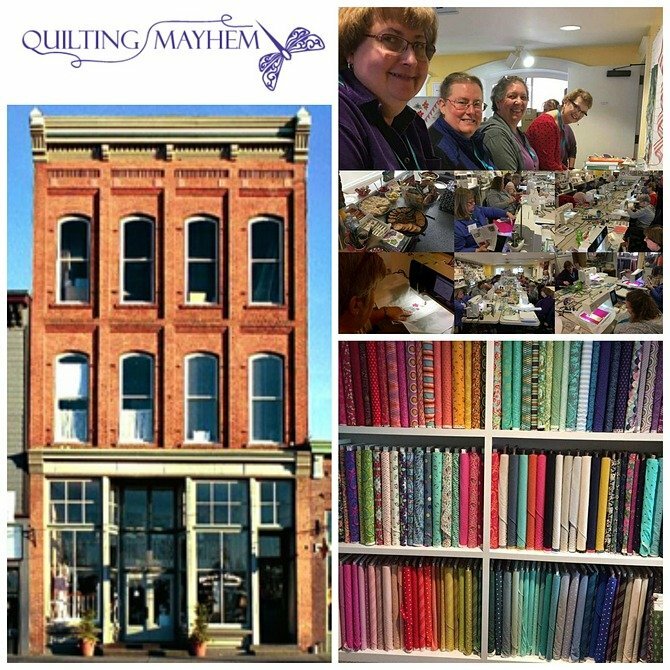 Quilting Mayhem is a family owned and operated company committed to providing a generous selection of high quality fabrics and quilting supplies to meet all your sewing needs. We’re always updating our inventory to make room for the industry’s latest product releases and accommodate the creative needs of our customers. As a longtime quilter with over 20 years of experience, Mindy (Quilting Mayhem co-owner) is passionate about sharing her love of sewing with all who wish to learn. She strives to maintain a friendly shop atmosphere where stitchers of all skill levels feel comfortable learning and creating. That's why we offer a wide range of classes, clubs, and social events that are informative, but low-key, to encourage fun...and success. Steve (Quilting Mayhem co-owner) has been involved with Quilting Mayhem since day one but mostly behind the scenes keeping the computers running, the internet connected and hanging those hard to reach items as needed. Steve retired at the start of 2016 to focus more on family and the family business. He built his over 20 year professional career as a senior computer engineer and architect with Children’s Hospital in Seattle and most recently with The Walt Disney Company. Steve is now in charge of our sewing machine service center, working exclusively with Quilting Mayhem repairing most brands and holds factory technician certifications from Bernina and Janome. Our goal here at Quilting Mayhem is to inspire the creative spirit within. We have a friendly, knowledgeable staff on hand to offer expert product advice, personalized service, and ongoing support throughout your quilting journey. Please feel free to contact us with any questions you may have. We're always happy to assist you however we can! Kaleidoscope Quilt Shop opened in the spring of 2001 and began with 300 bolts and a small assortment of books and notions. We have had 2 store expansions since that time, including a relocation in 20013. Our charming store is 2600 square feet and displays an average of 2200 bolts. We carry a wide variety of prints including batiks, traditional, western, brights, reproductions, children's, holiday, blenders, and more. We specialize in kits made with in house patterns designed by Carolyn Miller with CJ's Designs and Joy Cox with Joy's Creations. Other accroutrements carried include notions, books, and patterns. Our Second Saturday Block of the Month program has 125-150 participants each year. This is our fourth year to be a designated shop for Quilt Across Texas. Other annual events include Row by Row, and the Dallas and Plano Quilt Shows. The shop’s cozy atmosphere located in a 19th century historic downtown building, a family oriented run business, and our in house pattern designs and kits truly bring a unique shopping experience. 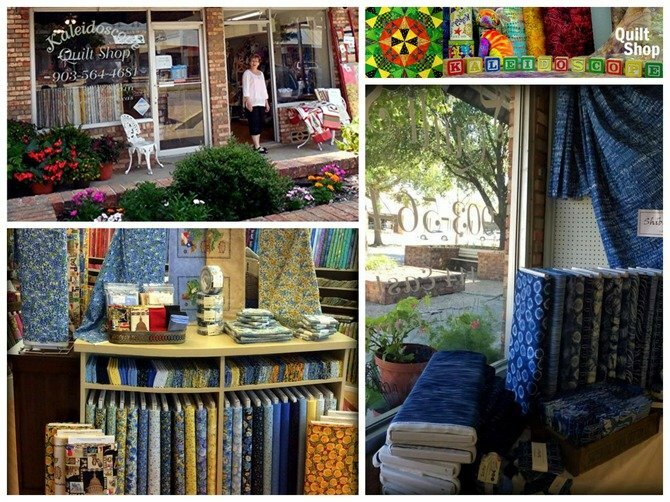 Our slogan of “Where Color and Design are ever changing” is evidenced with each visit to Kaleidoscope Quilt Shop. Feedback from customers about their favorite aspects of shopping with us include our variety of fabrics and our very personal service. Although we do not teach classes at our facility, we do provide personal instruction and tips on projects as needed. • Join Pat at her quilting Classroom on Facebook! Share your mystery quilt! • Also join FreeQuiltPatterns.info on Facebook. • If we have not met yet... it's super nice to know you!... Click here to learn about me. 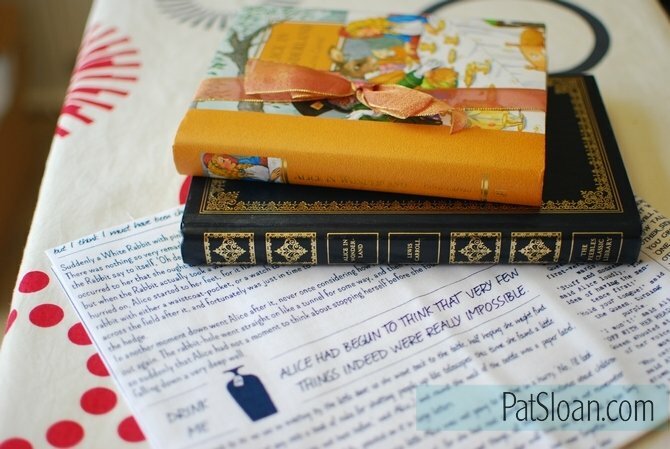 Do you have a favorite memory of reading Alice in Wonderland? What do you think of this block design? I'd love to hear your thoughts!